Mike Henry and Jeremy Thompson are both Consultant Surgeons at the Chelsea and Westminster and the Royal Marsden Hospitals. Being in the heart of centralLondon, their time is often spent treating the complaints of the famous (andno doubt sometimes the infamous), which if nothing else keeps life interesting and enlightening! Mike did his first training in London, Jeremy in Cambridge. Both have held Senior Lecturer posts at major universities in the UK, and have travelled abroad frequently in connection with researchand other projects. Mike's research interests include functional disorders of the large bowel and Jeremy's include adhesion formation and prevention. 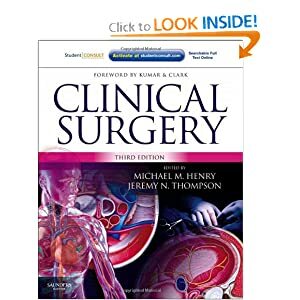 Both editors are members of the Surgical Research Society. Mike is a Fellow of the Royal Society of Medicine, was awarded the Patey Prize of the Surgical Research Society in 1971 and is a Fellow of the Royal Society of Medicine. Jeremy is a Fellow of the Association of Surgeons and a member of the British Society of Gastroenterology. Outside 'office hours', in addition to compiling this textbook, both editors try to find time for their families and friends, the occasional work-out, skiing holidays, and wining and dining! --This text refers to an out of print or unavailable edition of this title.